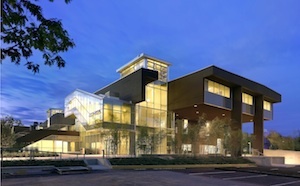 The Langara College Library/Classroom Building. Photo: Shai Gill. 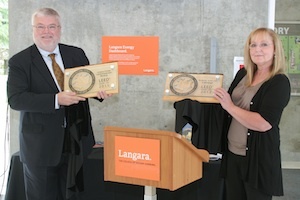 Vancouver, BC – Two “green” building complexes at Langara College were awarded special recognition for sustainability, it was announced today. The Library/Classroom Building and the Students’ Union/Building C complex, both at the College’s main campus, have been awarded LEED® Canada Gold Certification by the Green Building Council of Canada. The accolade is an internationally respected benchmark for the design, construction, and operation of green buildings. The pair of structures were designed by Teeple Architects and built by Bird Construction, and opened in 2007 and 2009 respectively. The buildings feature an impressive series of innovative green elements, including the incorporation of wind energy to provide ventilation and the use of fly-ash-infused concrete in construction. The Students’ Union/Building C complex is the first ever construction to feature Thermenex, a revolutionary thermal energy exchange system that was developed by local engineers. Amazingly, through the use of Thermenex, the complex produces zero greenhouse gas emissions from heating and cooling. The system has since been selected for incorporation into a variety of cutting edge constructions. The Library/Classroom Building has received numerous awards for its innovative and sustainable design, including the 2005 Canadian Architecture Award of Excellence, the 2005 Holcim Foundation Award, and the 2008 Sustainable Architecture & Building Award. Architect Jeff Christianson, who worked on the Library/Classroom Building project, was on hand at the ceremony to celebrate the achievement. The Leadership in Energy and Environmental Design (LEED®) Green Building Rating System is an internationally recognized system for evaluating the “green-ness” of building design and construction practices. Buildings that are awarded a LEED® certification incorporate leading-edge design, construction, and operational practices that protect the environment and promote healthy working conditions. LEED® Certification indicates that experienced professionals, working collaboratively, have arrived at a superior building design. Langara College, located in beautiful Vancouver, BC, Canada, provides University, Career, and Continuing Studies programs and courses to more than 23,000 students annually. The College’s expansive academic breadth and depth allow students to choose their own educational path. College President Dr. David Ross unveils the LEED® Canada Gold Certification plaques with Facilities Director Wendy Lannard. Photo: Jennifer Oehler.